S. L. MacGregor Mathers in his study of Goetia Spirits concluded that Sabnock "appears as an armed soldier with a lion's head who rides on a pale horse." Mathers, who copies his material from earlier observers of demonic spirits, adds that Sabnock's specialty is war-like. "He builds towers, castles, and cities and supplies them with armor. He also can cause men to be infected with wounds, sores, or worms for many days." Sixteenth Century student of the occult, Johann Wier perceived Sabnacke as “a great marquesse (sic) and strong. 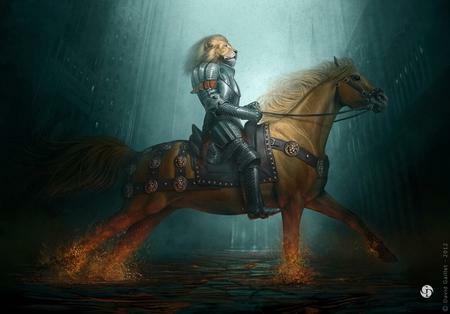 He commeth foorth (sic) as an armed soldier with a lions head, sitting on a pale horse." The conclusion: evoke Sabnock if you want to start a war.